Last semester anthropologist Alessandro Angelini and I (Quilian) co-tought a travel design studio. The studio was offered by the Design and Urban Ecologies program at Parsons, The New School of Design. This new masters program studies the city by creating a radically collaborative environment where designers and social/political scientists work side by side to help students gain a broad understanding of the complex economic, political, social, environmental, and physical forces that influence urban growth and development. This studio is the first in a series of collaborations with community organization Corporación Cultural Nuestra Gente (Casa Amarilla), situated in Comuna Santa Cruz — a neighborhood in the north of Medellín, Colombia — and URBAM, an urban studies program from EAFIT University. Together, we developed a studio curriculum around research and community engagement with the potential of creating self-sustaining improvements in economic and socio-spatial dimensions of the city of Medellin. 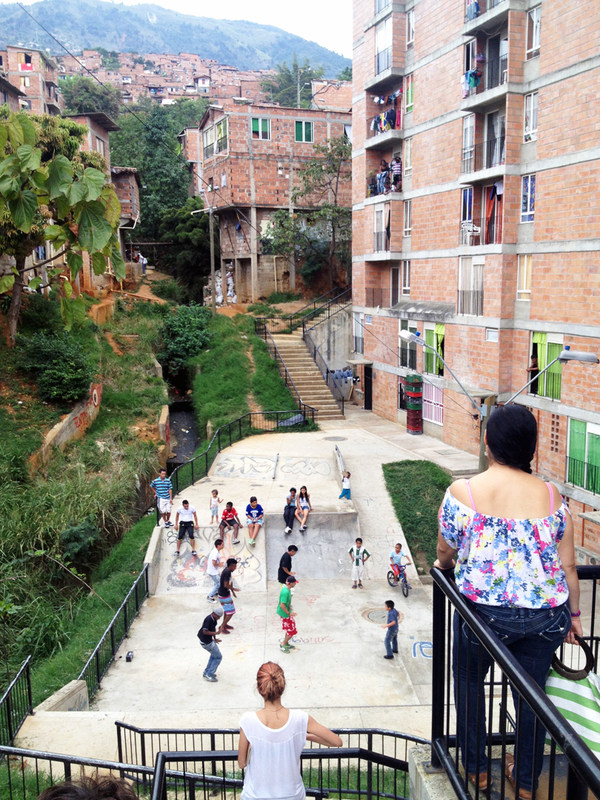 Medellin is an especially interesting context because of its last 20 years of history. The city has gown from being one of the most feared, to one of the most globally celebrated. We partnered with Corporación Cultural Nuestra Gente, a community theater and arts group that has seen all of Medellin’s changes over 30 years in Comuna Santa Cruz, one of Medellin’s neighborhoods affected by the violence that befell Colombia during most of the 1990’s and early 2000’s. Conceptually, Alessandro and I began the studio invoking Italo Calvino’s Invisible Cities. Our hypothesis was that underneath the new, celebrated, city there were many layers of political, economic and class structures that have become manifest in the form of the city. It was not until we talked more to Jorge Blandon and Erica Muriel from Nuestra Gente that we realized that they use theater for a similar purpose, using methodologies similar to those that Augusto Boal formulated for the Theater of the Oppressed. Boal introduced the notion of “spect-actors,” or an active audience, a method not only for participation, especially among young residents, but also to imagine AND practice social change. In short, he created a theater methodology that could become grass-roots activism. The Santa Cruz Visible studio team became interested how a similar methodology could be used for design, urbanism and architecture. Could we use design methods to make larger systems visible while creating opportunities for community-lead change? In the initial phase of the project our team engaged in developing community relationships and commence exhaustive research of Santa Cruz and surrounding areas. In April 2013, the team also conducted field research to confront the realities that condition the city, experience the sites to be intervened and to reinforce the participative dialogue of all project participants. During the Unitary Urban Research phase the objective was to develop research and fieldwork frameworks that have a capacity to grasp and operate inside the deep structures of a highly complex urban condition. In the Design of Community Urban Action Plan phase we defined the necessary components and processes for speculating strategic physical, social, economic and political ruptures to the existing complex, as well as assessing the real impacts of the recommended operation(s). It should be noted that it was not the goal of the studio to develop final designs. Simply put, the overall goal was to understand and speculate on complex urban conditions. The following thematics formed points of departure for the research teams: Communal Processes, Social Infrastructures, and Political Economies. Students developed lines of research and eventually re-assembled teams and their investigations under new paradigms, or “ecologies.” These ecologies formed the basis for the design strategies proposed at the end of the studio to a panel of critics in New York and our partners in Medellín. We know this is only the beginning to a longer project. In the next steps we will develop the physical and policy projects that were identified in this phase of the research. For now, take a look at the Santa Cruz Visible studio book to see our first set of findings. Studio Professors: Alessandro Angelini and Quilian Riano. Students: Alexandra Castillo-Kesper, Sabrina Dorsainvil, Lara Furtado, Troy Hallisey, Cristina Handal, Jonathan Lapalme, Luisa Munera, Aubrey Murdock, Joel Stein, Andrew Tucker, Anže Zadel. Studio Coordinator: Jesseka Mae Emerick. Consultants: William Morrish and Teddy Cruz. Also thanks to Cynthia Lawson, Brian McGrath, Shannon Mattern, Gabriela Perez Rendon, Miodrag Mitrasinovic, Aseem Inam, Frank Morales, Victoria Marshall, Landon Brown, Sukjong Hong, June Williamson, Mary Roldán, Mary Ellen Carroll, Patricia Tovar, Toni L. Griffin, Nicholas Ter Meer, Erik Ghenoiu for participating in reviews.